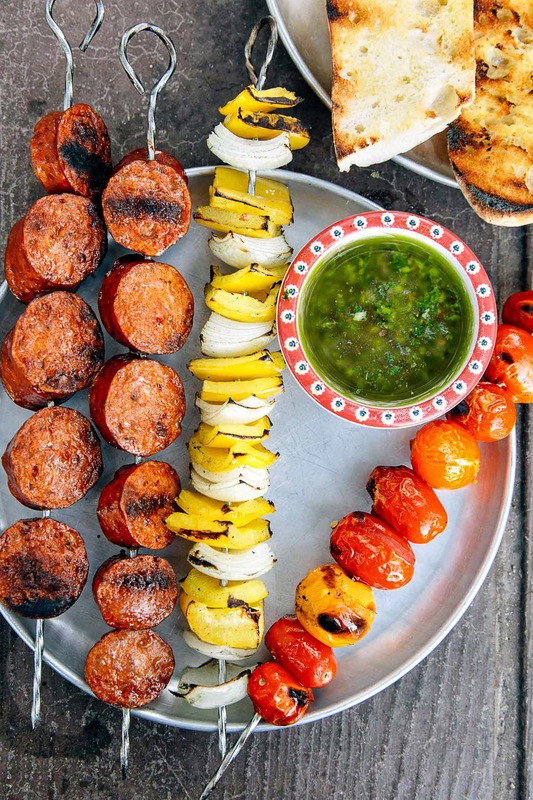 Inspired by the flavors of the Argentinian Pampas, this grilled chorizo kebab is a quick and easy camping dinner that’s best enjoyed over an open fire. We can think of few other national cuisines more heavily influenced by cooking over a fire than that of Argentina. Steaks, sausages, bread, and even citrus – everything there seems to be enhanced by adding a few grill marks. In Argentina, asado (barbeque) is intrinsically linked to food culture. This kebab is a tribute to that way of cooking and the idea that fire makes everything taste better. It is hard to find good Argentine-style chorizo in the US. There’s a lot of great Mexican-style chorizo, which is made from fatty pork and is supposed to be loose and crumbly. But the firmer, leaner cut chorizo found in South America is more difficult to track down. 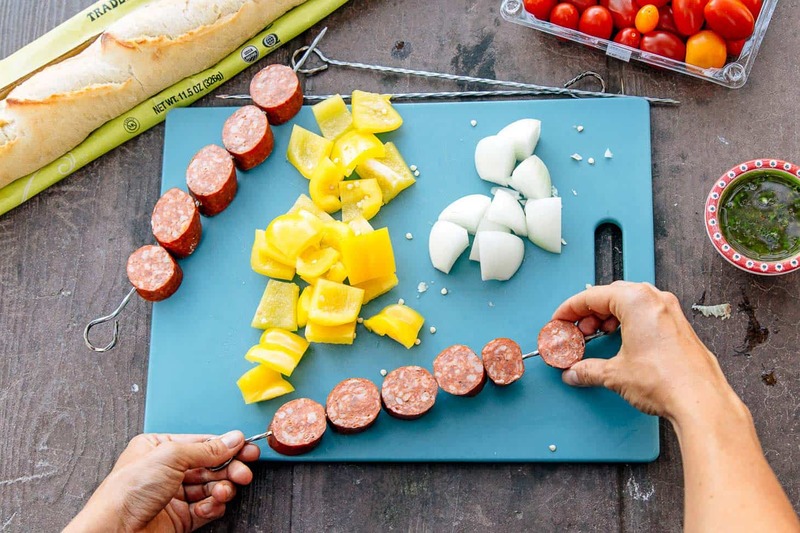 Using what we could find at our local grocery store here in Bend, we decided to make this recipe with a more readily-available Portuguese-style chouriço sausage. It’s not exactly a proper Argentine chorizo sausage, but it was close enough. The type our grocery store carried was pre-cooked, which actually made it easier to skewer. We just wanted to put a char on the outside, so it was fine. We also included some bell peppers, onions, and cherry tomatoes. These vegetables always taste better when grilled, plus they’re nearly impossible to screw up! A halved baguette lightly covered in olive oil was also tossed on the grill towards the end. Off the grill, all of this stuff tastes amazing. But what really brings it together is homemade chimichurri sauce. In the US, we have BBQ sauce. In Argentina, they have chimichurri. A light, bright, garlicky delight! While a rudimentary chimichurri sauce can be made at the campsite, we highly recommend making it at home ahead of time. Reason 1) Using a food processor makes everyone’s life easier, and 2) the sauce really does benefit from having a day or two to sit and mellow out. Just put it in a tightly sealed jar in your cooler before your trip. 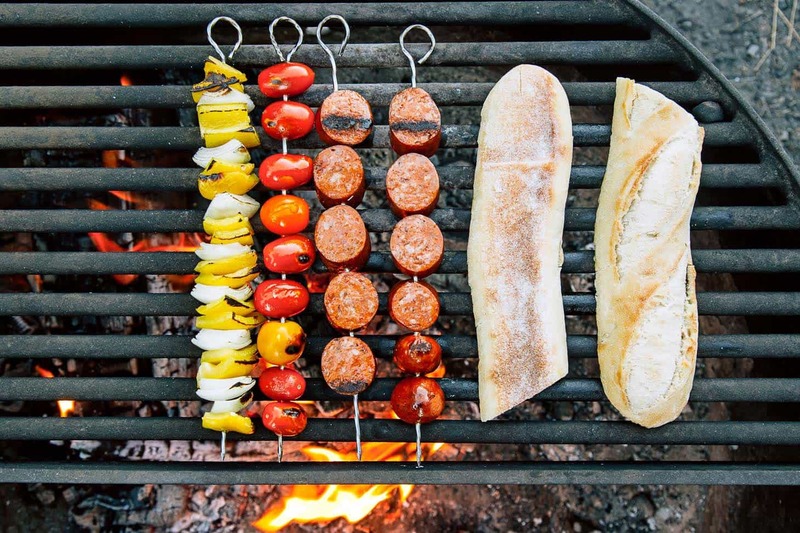 So if you’re looking to experience a taste of asado Argentino the next time you go camping, give this quick and easy kebab recipe a try. Place the parsley, oregano, garlic, salt, red pepper flakes, and red wine vinegar into the bowl of a small food processor and pulse a few times. Then, with the food processor running, add the olive oil through the top in a steady stream until the chimichurri reaches the consistency you'd like. 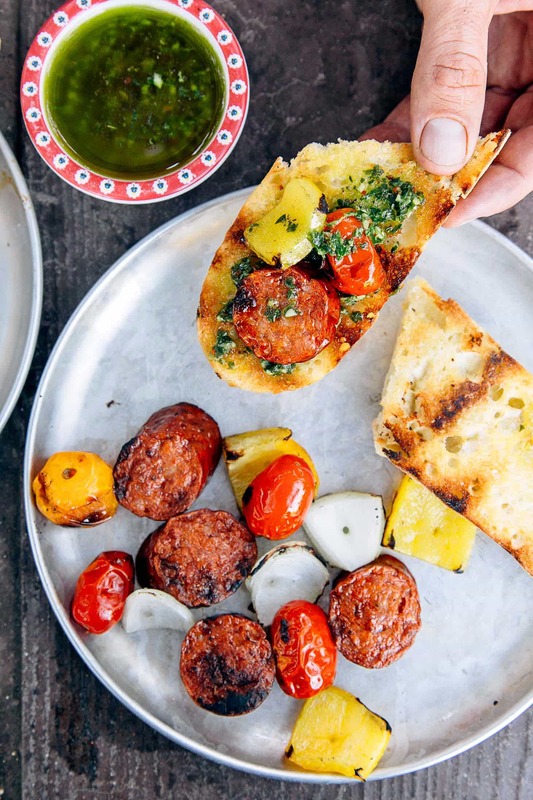 Taste and season as necessary - there are no rules to chimichurri so feel free to play around with it to make it more herby, spicier, or tangier as you feel fit! Fire up your grill or get your campfire going. You’ll be cooking the kebabs over medium-high to high heat. 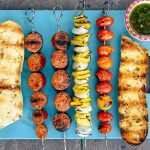 Build your skewers by threading the chorizo and tomatoes on their own skewers, and the bell pepper and onion together onto a skewer. Brush the skewers with a touch of olive oil and season with salt. 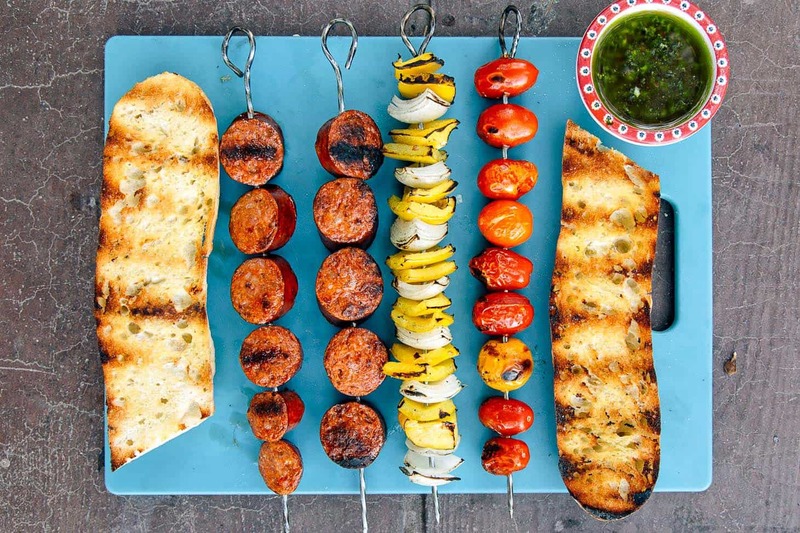 Once the grill has reached a medium-high heat, place all the skewers on the grate. Grill, turning often, until the chorizo has cooked through (about 10 minutes), the onions and bell peppers are cooked through (about 10 minutes), and the tomatoes are soft and beginning to blister (about 4 minutes). Brush cut sides of the baguette slices with olive oil and place over the fire until toasted and grill marks form (about 5 minutes). 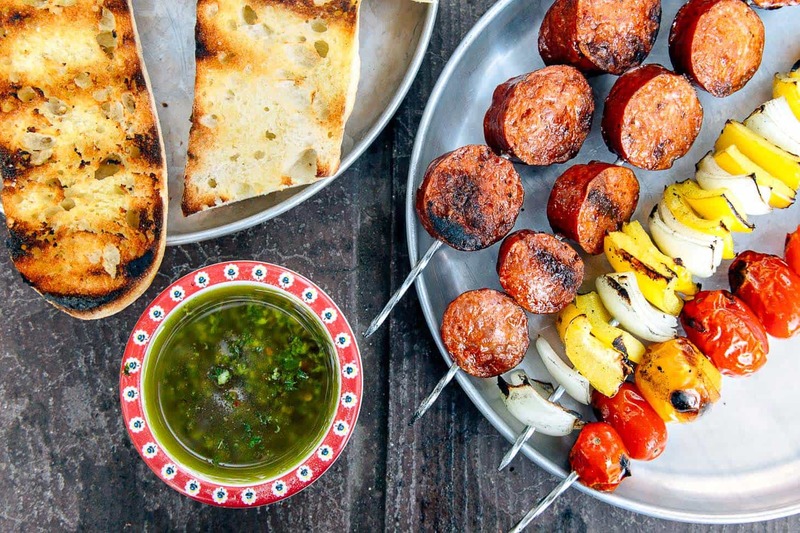 Remove skewers from the grill and serve with the chimichurri sauce. You can use a number of chorizo-style sausages for this recipe, depending on what is available locally. The one type to avoid is Mexican chorizo because it is crumbly and won't hold up to being sliced and grilled. Great post and pictures… seems like a simple enough recipe that we’ll have to try!